Recently I was challenged by the following question: How can I determine the region of a certain IP address. Down below you will see a little screenshot of the underlying tables. The next table shows some ranges, a region is determined by an starting ip address and an ending ip address. As you may have noticed there is an overlap of ip addresses in the region "This" and "Another This". The next table shows the IPs that need a region to unleash more analytical power. Please be aware that I added the "comment" column, just to get a hint what I would expect after adding some "data quality" measures. So basically my idea behind this, is to convert the well formed IP4 addresses into a numeric value and then use some DAX statements to lookup the region. 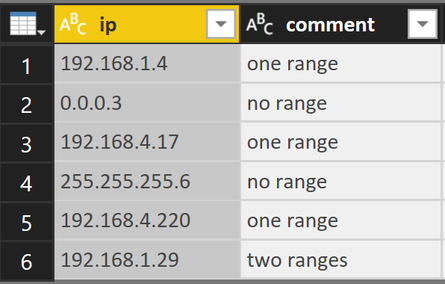 As you may already have noticed, there are two ip ranges with overlapping addresses, "This" and "Another This". This will be treated using some data quality measures. Create an additive sum by iterating over each octet from the ip, during each iteration the numeric value representing the octet is multiplied by 256n. n is derived by the number of iterations. Basically this can be achieved by "simply" using a little custom M function in Power Query. Unfortunately there is no simple FOR … NEXT or DO … WHILE available in M. But there are some functions that can be used to iterate over "things". The function uses two lists, the lists of octets and a simple list just containing the numbers from 0 to 3. If you are not familiar with functional programming the short description provided by the official documetation can be somewhat frightening. What the description says is, the following, this functions iterates over a list (the 1st parameter) and passes an initial value (the 2nd parameter) to an accumulator function, the 3rd parameter. Even without defining a variable that is called state or current the example works flawless if used inside Power Query as a function for a custom column. It's not necessary that both variables have to be named state and current, you can name to your liking. The initial value (the 2nd parameter of List.Accumulate) and the first element of the list are passed as parameters "state" and "current" to the function that simply adds 1 (current) to 0 (state). The function List.Accumulates iterates over the list "ListOfIndexItems". This list just contains 4 values, namely the numbers 0, 1, 3, 4.
are passed to the accumulator function. Here you will find a pbix file that contains some sample data, the function another function that converts a given number to a ip4 address and also some DAX statements to check the quality of the source data.